Includes one Barbara Stanwyck wig ub a ratted looking pageboy like Barbara wore in "Double Indemnity". The wig features an elastic band for a comfortable and secure fit to almost any head size. 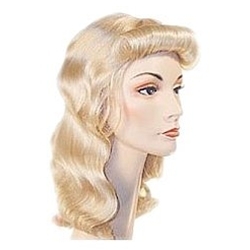 This wig can also be used for other characters including The Andrew's Sisters and 1940's - 1950's Pin-up or USO girls.